I’m one of the CRM specialists here at Altico Advisors and in that role, I implement Microsoft Dynamics CRM for our clients. Step one is to understand their business requirements. So I have a pretty good understanding of why they want a CRM system and once it’s implemented, what they love about it. But we also use Microsoft Dynamics CRM internally and I was wondering, what do my colleagues here at Altico love about CRM? This led me to conduct a brief, informal survey. Basically, I just asked all of my colleagues what they liked best about Dynamics CRM. And since I’m not a business owner, and I’m also not in sales, marketing, or administration, the answers to that simple question were quite revealing to me. For the sake of brevity, I’ve grouped the responses into categories and I’ve listed just the top 2 or 3 answers. The Owners – They love Microsoft CRM because it’s user friendly, so the adoption rate has been 100%! Every single person here at Altico uses Dynamics CRM as part of their job and it makes them more efficient and more accountable. It’s a business owner’s dream come true. The Sales Manager – He loves Microsoft Dynamics CRM for Sales Force Automation because it gives him peace of mind knowing that critical contact information for prospects resides in a single system, as opposed to an individual’s Rolodex, or worse yet, on little bits of paper and sticky notes. He also loves knowing that new business leads aren’t falling through the cracks. The Sales Team – They love CRM because the information they need about the leads and prospects they’re working with is always at their fingertips. And they can easily track their own performance metrics. As but one example, they can track how many opportunities they developed and how long each opportunity was in the pipeline before it closed. The Marketing Team – They seem to love everything about CRM for Marketing. The ability to set up and track targeted marketing campaigns, send group emails to segmented lists based on any criteria they choose (such as title or industry to name but two), track lead source so they know which efforts are paying off, schedule drip campaigns, manage multiple lists, provide metrics to The Owners virtually on demand. The Accounting Department – Of course, these folks use Dynamics GP for overall financial management. 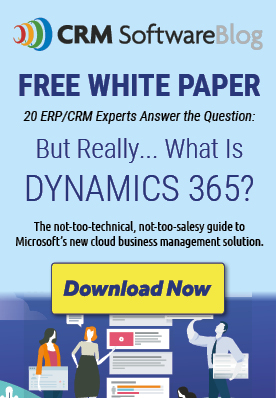 But since Dynamics CRM and Dynamics GP are integrated, there’s no double entry of information. It’s easy to track invoices, payables, receivables, enhancement renewals, cash flow. Since everyone uses CRM but not everyone uses GP, they can flag credit holds and the like in CRM so everyone knows the status of an account. Customer Service – They love CRM for Service because it’s so easy to enter and track support incidents. And that’s what they do all day so it’s a critical piece for these folks. Developers – One word: workflow. They love it. The Implementation Team – I might not have realized how important this feature could be if I hadn’t talked to this team. They love the shared calendar in Microsoft CRM which helps them keep their appointments straight, avoid double booking, and know exactly where to reach their colleagues if they need to get in touch with each other when technical questions come up and they want to collaborate on a solution. Wasn’t it Abraham Lincoln who said: You can’t please all of the people all of the time? Well it sounds like Microsoft Dynamics CRM comes close. Of course, depending on your role, you may love different features within CRM. But the point is that everyone loves it. Thanks for the great post, very informative, I look forward to reading more from you. Thanks, Sharron. We hope to live up to your expectations! Roles are described decently thanks…!! !